The American Needlepoint Guild, Inc. is an educational, non-profit organization whose purpose is educational and cultural development through participation in and encouragement of interest in the art of needlepoint. ANG defines needlepoint as any counted or free stitchery worked by hand with a threaded needle on a readily countable ground. 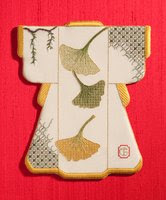 Above you can see two examples of the Ginkgo motif used in a 2010 seminar class.